Police officers attend to the scene after a vehicle collided with pedestrians in the Finsbury Park neighbourhood of North London on June 19, 2017. A white man plowed a van into a crowd of Muslim worshippers outside a north London mosque on Sunday night. One man was killed, though police did not confirm whether the vehicle attack was the immediate cause. Eleven other people were injured. Police are investigating it as a terrorist incident. Already stretched by a series of major incidents around the capital, London’s police force is putting more officers on the street to reassure the public. British media have named the suspect in Monday’s attack as 47-year-old Darren Osborne, a father of four who was living in Cardiff, Wales. 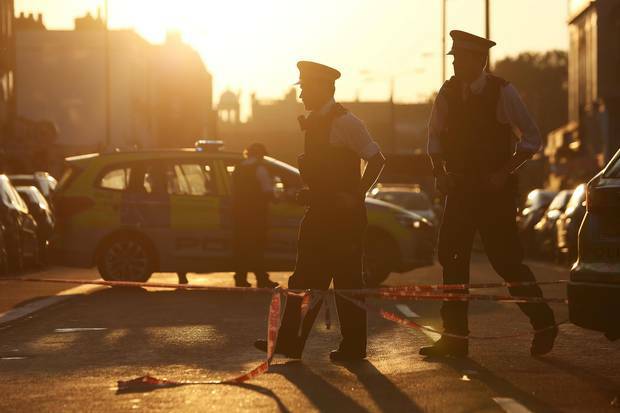 London police said the man had been arrested on suspicion of commission, preparation or instigation of terrorism including murder as well as attempted murder. Muslim leaders called the attack a hate crime motivated by Islamophobia and asked the public to stay calm. 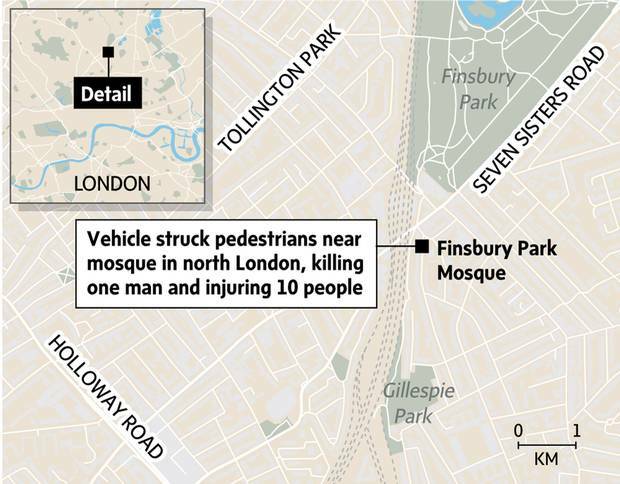 The crash occurred shortly after midnight Sunday night, at a time when the multiethnic neighbourhood was crowded with Muslims leaving the Finsbury Park mosque after Ramadan prayers. He was happy, smiling, giving victory signs. He was waving a goodbye to us. This is a proper criminal … He was enjoying what he’d done. 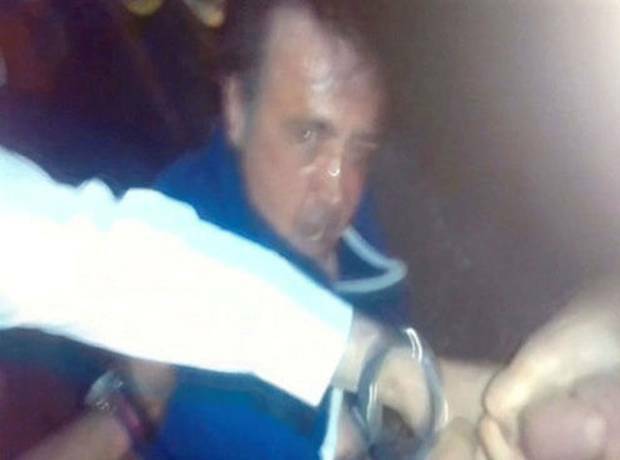 In a still image from video obtained from social media, a man is led to a police van after the vehicle collision. Dead: As of Monday morning, the person killed had not been identified. 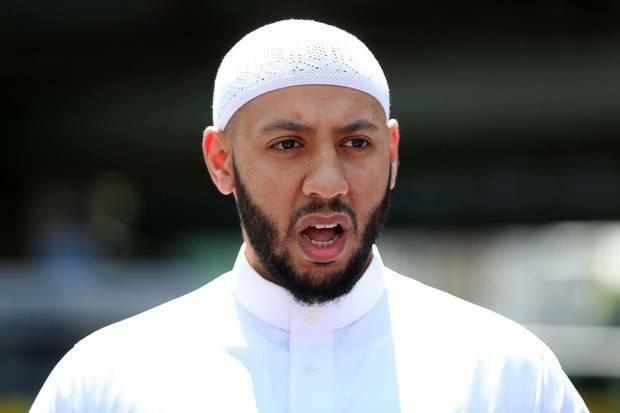 In a statement, police described the person as a worshipper who was receiving first aid outside the mosque at the time of the attack and died at the scene. But they said it wasn't clear if he died from the van attack or something else. Injured: Police said nine of the injured were hospitalized; the other two had minor injuries and were treated at the scene. Eyewitnesses reported seeing police give emergency heart massage to at least one of the injured. 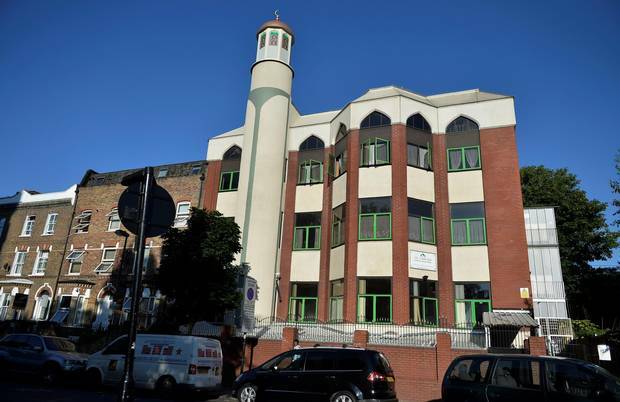 The Finsbury Park mosque was associated with extremist ideology for several years after the Sept. 11, 2001, attacks in the United States, but was shut down and reorganized. It has not been associated with radical views for more than a decade. A general view of the Finsbury Park mosque. We found that a group of people quickly started to collect around him, around the assailant and some tried to hit him either with kicks or punches. By God’s grace we managed to surround him and to protect him from any harm. [The imam’s] bravery and courage helped calm the immediate situation after the incident and prevented further injuries and potential loss of life. Imam Mohammed Mahmoud gives a statement to the media at a police cordon in Finsbury Park on June 19, 2017. During the night, ordinary British citizens were set upon while they were going about their lives, completing their night worship. It appears from eyewitness accounts that the perpetrator was motivated by Islamophobia. The chairman of the Finsbury Park Mosque says the van crash that hit worshippers was a "cowardly attack" and urged Muslims going to mosques to be vigilant. Mohammed Kozbar said the Muslim community is "in shock." He complained that the "mainstream media" was unwilling to call the attack a terrorist incident for many hours. British Home Secretary Amber Rudd said police "immediately" treated the incident as a suspected terrorist attack. Theresa May: The Prime Minister described the crash as a "potential terrorist attack" before visiting the Finsbury Park mosque on Monday. She said her thoughts were with the injured, their loved ones and emergency officials who responded to the incident. She also said she would chair an emergency security cabinet session. Jeremy Corbyn: The leader of the opposition Labour Party offered his condolences and met with Muslim community leaders on Monday. He described an attack on mosque worshippers as an "attack on all of us." Sunday night's attack prompted messages of condolence from several world leaders. Saddened by the terrible incident in London last night. My thoughts are with those affected, all Londoners and the British people. Sunday night's attack in London is one of several terrorist incidents Britons have endured in recent months. London Bridge: Earlier this month, a van veered into pedestrians on London Bridge, setting off vehicle and knife attacks that killed eight people and wounded many others on the bridge and in the nearby Borough Market area. Three men who carried out the attack were killed by police. Manchester: Manchester was also hit by a severe attack when a bomber killed more than 20 people at an Ariana Grande concert in May. 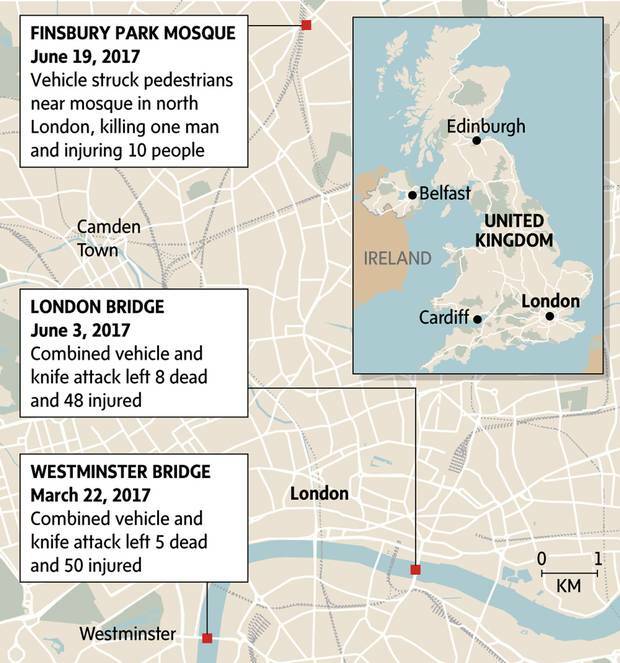 Westminster Bridge: In March, a knife-wielding assailant driving a sport utility vehicle killed five people when he drove into pedestrians outside London's Parliament buildings and then fatally stabbed a police officer. Britain's terrorist alert is currently set at "severe," meaning an attack is highly likely. British security officials cited by Associated Press, speaking on condition of anonymity in line with official policy, said hate crimes directed at Muslims have increased nearly five-fold in the wake of several attacks in Britain. 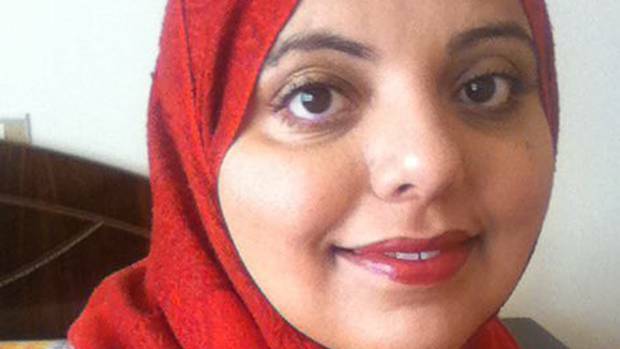 Shaista Aziz: Countering extremism requires political honesty from Theresa May We’ve all been affected by terrorism. As for the narrative that there is an us and them when it comes to tackling terrorism, enough is enough – there is only we. 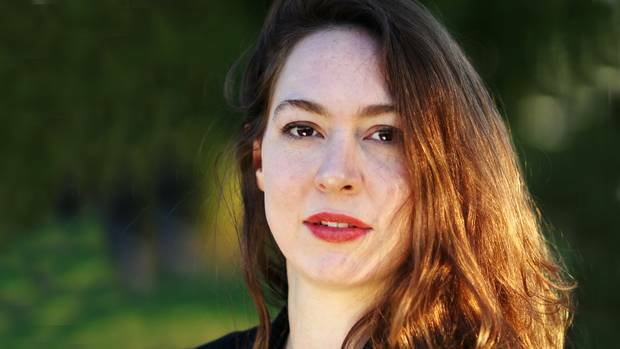 Zoe Cormier: Why I won’t leave London, ever A Canadian author and journalist who lives in London says that, while the country she calls home has been hit by terrorism, the funny, brave Brits are more than enough reason to stay.